Originally a 7’s team, the Beaver Nomads became a 15-a-side rugby team in Dubai in 2015. It was during this first season of full 15’s rugby that the Nomads were crowned UAE Community League Champions 2015/16 in it’s inaugural year. The Nomads started playing in the Dubai Emirates Rugby Sevens back in 1998, and still to this day manage to put 3 teams in the popular rugby 7’s tournament, including a vets squad for the over 35’s section. 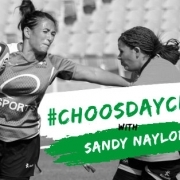 We got in touch with Co Chariman – Karl McGowen to ask him why people should join the Beaver Nomads rugby club and what it is that really sets them apart from the other clubs in the area. “I think the Beaver Nomads is all about mates really. 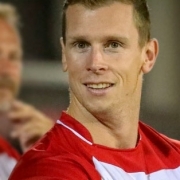 We’re a social rugby team, having last year won the UAE Community League and this season we finished 3rd.” said McGowen. If you’ve played before or never picked up a rugby ball in your life, the Beaver Nomads would be a great place to start. “Our focus is more about having fun, while playing rugby. We’ve got a mix of players who have never played rugby before, to international level.” added McGowen. 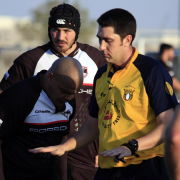 At the moment, the Nomads only have the one team, playing in the UAE Community League (Tier 3 UAE rugby) offering mens rugby to 19 years of age and above. Training only once a week, they’re more suited to the newbies to ex-players who are interested in getting a social game of rugby once a fortnight, yet still allowing you to keep those all important social commitments that we all know and love – the Friday Brunches! 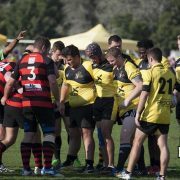 If you’re interested in playing rugby in Dubai, be sure to get in touch with Karl either by visiting the Beaver Nomads club profile page or by visiting their Facebook Page.